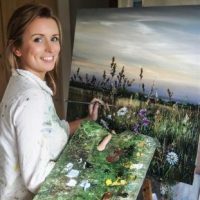 I quickly developed my own signature style, focusing on the natural beauty of the countryside that I am so lucky to be surrounded by. With an emphasis on colour and light and how one affects the other at different times of the day, Turner’s artistic inspiration is never far from my thoughts. The process of layering and blending the palette knife work to obtain the right tone, texture and light is so important to me’.